Kai Selvon is this week’s Track Beauty! The sprinter is an up and coming athlete from Trinidad and Tobago. She competes in both the 100m and 200m, as well as in the 4x100m relay for the Trinidadian national team. To date, Selvon has personal bests of 11.21s and 22.85s. Mary Onyali-Omagbemi is this week’s Track Beauty! The retired Nigerian sprinter is an athletics legend. It is difficult enough to qualify for one or two Olympic Games, but Onyali-Omagbemi represented her country at the Seoul, Barcelona, Atlanta, Sydney and Athens Olympics. She had also won seven All-Africa sprinting titles and two Commonwealth Games gold medals. The ladies’ half-lap sprint, like most of the most of the dashes, will pit the United States versus Jamaica. 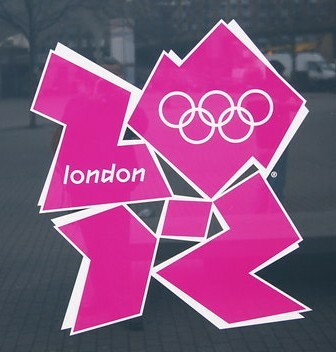 With the Olympics barely two months away, the U.S. holds a commanding lead against the Jamaicans – on paper, at least. Out of the top ten performances this year, nine were run by Americans. The only exception is Shelly-Ann Fraser-Pryce, the Beijing 100m dash champion, who ran 22.10s at the Jamaican Olympic Trials. 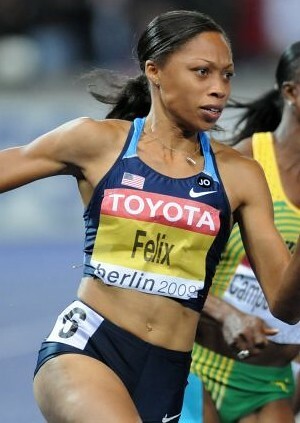 Allyson Felix is the world leader at 21.69s, the the fifth fastest all-time. 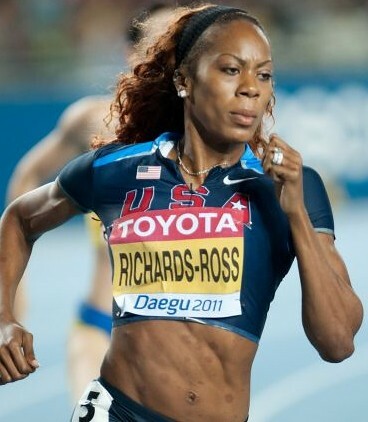 The other two American bets in the 20m dash, Sanya Richards-Ross (22.09s) and Carmelita Jeter (22.11s) are ranked 2nd and 4th, respectively. The American squad is a potent mix of quarter-mile talent (Richards-Ross), brute explosiveness (Jeter), and all-around sprinting excellence (Felix). Going head-to-head against the Americans are experienced Jamaican troika of Fraser-Pryce, Veronica Campbell-Brown (22.38s), and Sherone Simpson (22.37s). 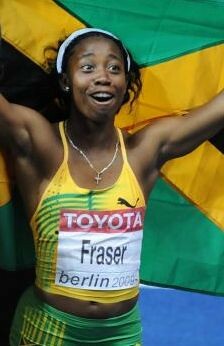 The 27-year old Simpson is the 100m dash silver medalist from Beijing, behind Fraser-Pryce. 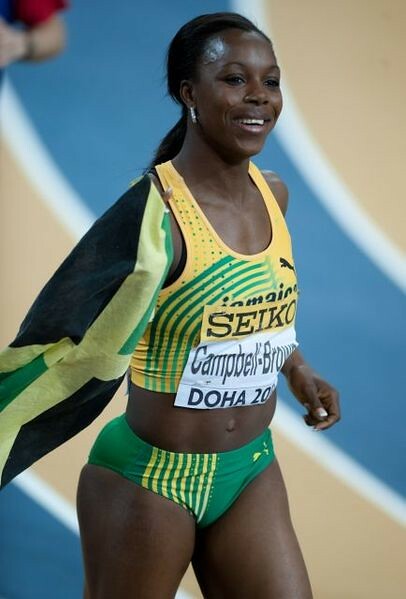 Campbell-Brown is a living athletics legend, who is gunning for her third consecutive Olympic 200m dash title. VCB, as she is fondly called, ruled the 100m and 200m in Daegu, taking gold ahead of Jeter and Felix, respectively. Other candidates for a spot in the final are Murielle Ahoure, Nercely Soto, Semoy Hackett, Blessing Okagbare, and Sheniqua Ferguson. The strongest European hopes are Ukraine’s Elyzaveta Bryzgina and Mariya Ryemyen and the Netherlands’ Dafne Schippers. 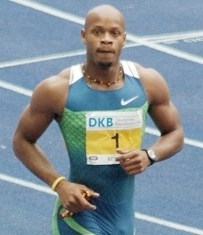 In terms of personal bests, Felix (21.69s – 2012) and Campbell-Brown (21.77s – 2008) are ahead of the pack, being the only two sprinters who had run below the 22-second barrier. Simpson has a personal best of 22.00s from 2006, set when she was just 21-years old. Richards Ross and Jeter, who had set their respective bests at the Olympic Trials in Eugene, are low-22 second speedsters. Felix, Richards-Ross, Fraser-Pryce, and Jeter, in light of their recent lifetime bests, have the statistical upper hand. But VCB, as the two-time Olympic champion and the reigning world titlist, could just make it three straight. A repeat of Felix and Campbell-Brown’s Daegu duel could happen. The 200m is tough to call; it could go both ways. As much as I’d like to see VCB take her third, straight half-lap gold, I have a strong feeling that London 2012 will be Allyson Felix’ dance with Olympic glory. The top two spots in the men’s race is a two-pronged slug fest between training partners Usain Bolt and Yohan Blake. 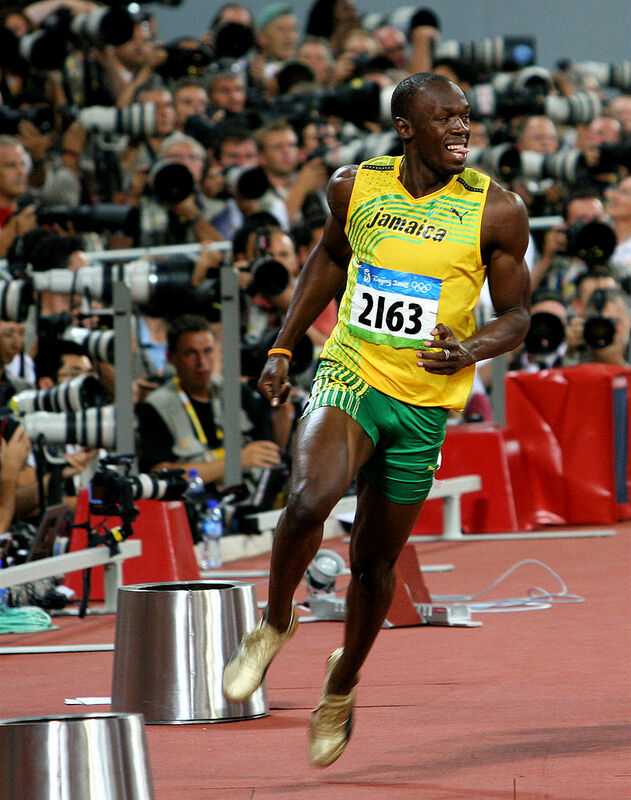 Bolt’s recent double defeats to Blake have exposed chinks in the Lightning Bolt’s armor. While his 100m dash defeat was not entirely shocking, considering the starting lapses Bolt has made of late, Blake’s 200m dash win is more surprising. 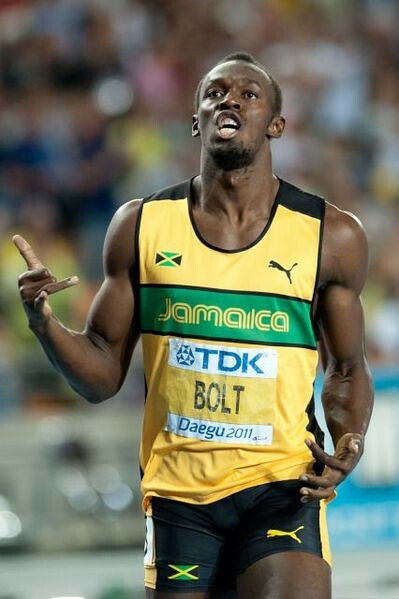 Even if the 2011 100m dash World Champion owns the second fastest 200m clocking of all-time at 19.26s, Bolt’s 19.19s from Berlin is considerably faster. 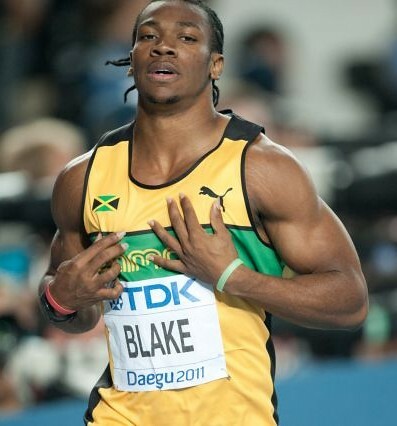 At his best, the 100m/200m world record holder is undefeatable in the half-lap – even to an in-form Blake. With the absence of the injured Walter Dix (19.53s PB) and the comebacking Tyson Gay (19.58s PB) in the 200m dash field, the next best, non-Jamaican challenge will come from Wallace Spearmon (19.95s SB). 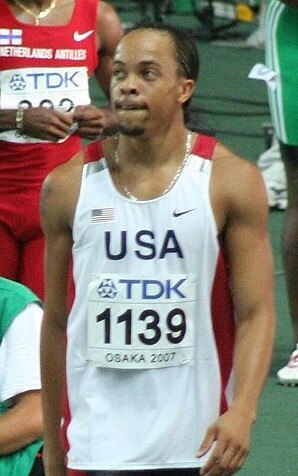 Spearmon is the seventh fastest in over the distance, having a personal best of 19.65s from 2006. France’s Christophe Lemaitre (20.31s SB) has a fair chance of landing a podium spot. Still only 22-years old, the Frenchman has a lifetime best of 19.80s from the 2011 Daegu World Championships where he took bronze, behind Bolt and Dix. The other protagonists are Churandy Martina (19.94s SB) and Warren Weir (19.99s SB), both sub-20 sprinters this season. Martina initially won 200m dash silver in Beijing, but was disqualified due to a lane infraction. Bronze: Christophe Lemaitre/Wallace Spearmon/Churandy Martina. Dafne Schippers is this week’s Track Beauty! Schippers started out as an excellent heptathlete in her junior and youth days, but has since ventured to the sprints. 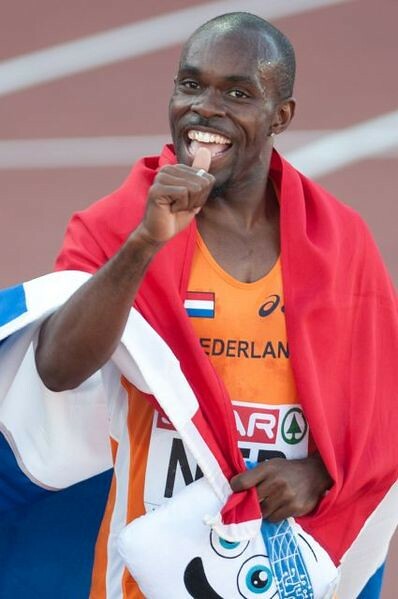 The Dutch athlete won the World Junior title in Moncton back in 2010, scoring 5,967 points. A year later, she topped the European Junior Championships in Tallinn, amassing a total of 6,153 points. With three European titles and two medals from the Daegu World Championships, it is fascinating to think that Christophe Lemaitre is just a youngster. At twenty-one years old, the Frenchman had just begun his university studies, days after his groundbreaking performance in Daegu. Matt Stroup of Universal Sports had some interesting thoughts on Lemaitre’s possible conduct in class. With his fourth place in the 100m dash, a bronze in the 200m dash and a silver in the 4x100m relay, Lemaitre had announced his arrival at the global stage. Indeed, he is no fluke – no mere one-hit wonder. His relative youth, as shown by the clip above, belies his potent speed on the track. Olivia Borlée is this week’s track beauty! The 24-year old Belgian is a 200m specialist, with a personal best of 22.89s in the half lap. Her best time in the century dash is a respectable 11.39s. 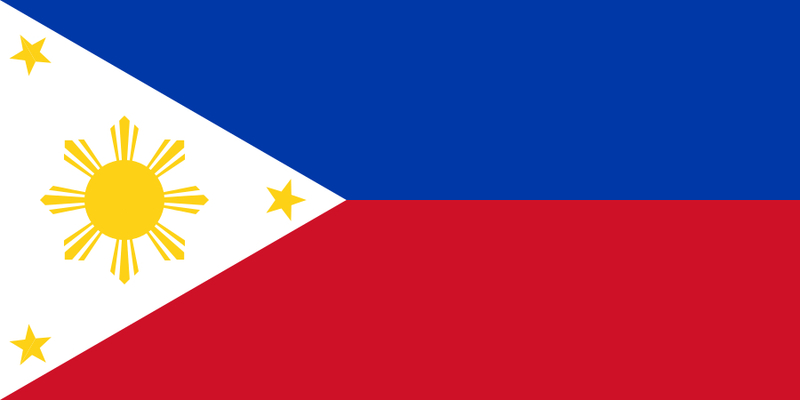 The eldest of the Borlée siblings has two major championship 4x100m relay medals to her name – a bronze in the 2007 Osaka World Championships and a silver at the 2008 Beijing Olympics. At the Barcelona European Championships, Borlée failed to go beyond the semis, finishing sixth in her heat. Olivia and her twin brothers are trained by their father, Jacques. Off the track, Borlée is working towards a degree in fashion design, while aiming to represent Belgium at the 2012 London Games. Shingo Suetsugo’s (末續 慎吾) Historic World Championship 200m Bronze! For the longest time, I’ve been scouring the net for a longer clip of the 2003 Paris World Championships 200m Final. It was where Shingo Suetsugo (20.38) unexpectedly clung on to an historic bronze medal finish – a first for an Asian man at major athletics meets. 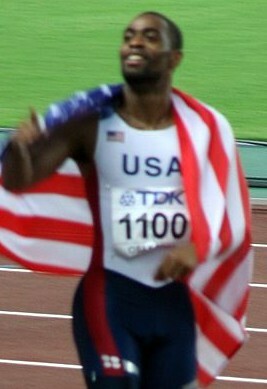 The Asian record holder finished behind Americans John Capel (20.30) and Darvis Patton (20.31). The indefatigable Frankie Fredericks (20.47) crossed the finish line a distant 7th, not bad for 36-year old. Suetsugo’s reaction when he found out he got bronze is priceless – truly priceless! Although he did win a splendid Olympic bronze at the 2008 Beijing Olympic Games, it’s pity how he faded into insignificance as an individual sprinter. When Suetsugo and Liu Xiang both won their respective bronzes in Paris 2003, I thought that the former could go all the way to the Athens Olympics. Suetsugo should have just focused on his event, the 200m dash (20.03), instead of aiming to break the 10-second barrier in the century dash (PB – 10.03). Take a look at the Barcelona European Championships 200m final results. Ahead of everyone is the superb French speedster, Christophe Lemaitre (20.37s), who pipped Britain’s Christian Malcolm (20.38s) by 1/100th of a second in a monstrous last-ditch burst to the tape. At the bottom of the 8-person list is another Frenchman, David Alerte. Beside his name is a time more suitable for a relay split, not a 200m dash final – 1:27.42. Alerte injured a muscle 80m into the race, ruining his chances for a podium finish. Courageously, the French sprinter walked to the finish line, reminiscent of Derek Redmond’s emphatic act of willpower, which, incidentally happened at the very same Olympic stadium. The stadium did not burst into cheers (or the occasional tear) as Alerte walked painfully down the track, perhaps because (1) Alerte’s father did not come out of the stands to assist his hobbling son or (2) simply because the European Championships is not as big as the Olympics. Hey, David, at least you didn’t get a DSQ like Derek did! David Alerte, I salute you!